Blake Buffington took down the last event before the big $25,000 Main Event on Friday, capturing the $2500 buyin seniors event and winning $191,030 in the process. Buffington outlasted Mike Stonehill in a heads-up battle that ended when Stonehill moved in after the turn holding an open ended straight draw and Buffington holding an overpair. The board was J 6 4 7, and Stonehill held 8 9 while Buffington held pocket Queens. The river was another 7, giving Buffington two pair and the victory. 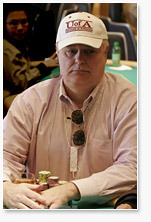 Earlier, Jim Flynn was eliminated in third place when he pushed all-in after a flop of 9 5 4 holding K 9. Unfortunately for Flynn, Buffington was holding a flopped set of 5's, and there was no runner runner magic for Flynn and he was eliminated in third place, taking home just under $50,000 for his troubles. For winning this tournament, Buffington will receive the gold championship bracelet, and most importantly, an entry to the $25,000 Main Event that starts on Saturday. Buffington came extremely close to being eliminated in 5th place, as he was all-in with pocket Jacks and his opponents A Q. The flop came A 6 5, however the turn and river provided some runner - runner magic as Buffington rivered a flush.